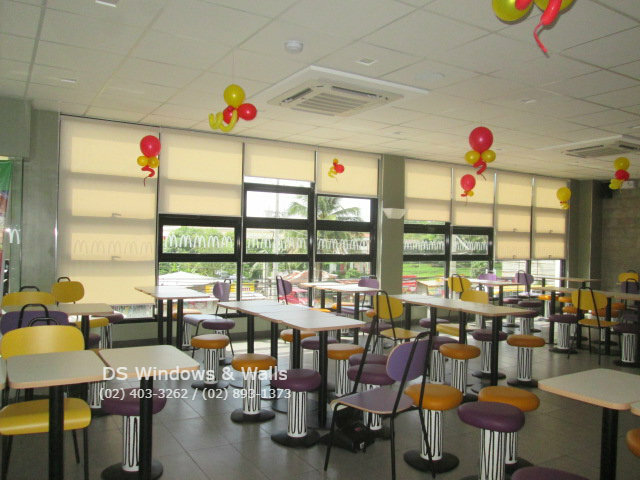 Our feature for today’s blog is about our roll-up shades project in the newly launched McDonald’s branch in Pagbilao, Quezon which opened last 28th of May in the said town. Customers from all over the municipality and nearby towns came to join the launch as the famous food chain extended the fun and the love to the townspeople of Pagbilao as well as to travelers heading south. 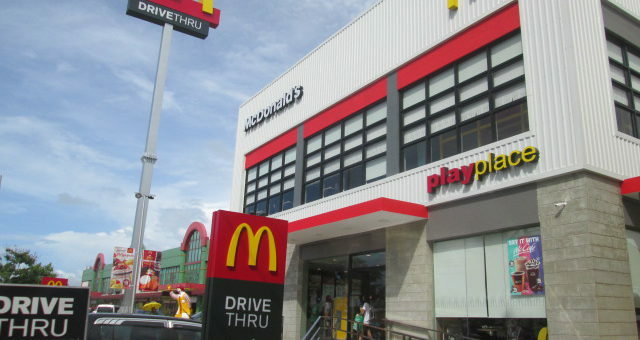 This McDonald’s branch is much alive with its approachable crew, the fast food chain’s signature specialties, a playground for kids, a Drive-Thru for passersby plus the excellent warm atmosphere for everyone to enjoy. Aside from these, the fast food chain’s stylish and live set up partnered with McDonald’s design schemes came noteworthy and is a contributing factor to the place’s overall impression. beige roller-up shades installed for their windows. Roller blinds, as modern society requires, serve as a very functional tool to cover windows or any other part of different establishments because of its easy maintenance and varied purposes when it comes to either enhancing an interior’s appearance or minimizing a room’s light intake. The roll up shades at this McDonald’s branch came very convenient for it blocks sunlight from outside. This factor is very important for too much light intake will affect customers’ stay as well as the crew’s performance when the heat of the sun comes inconvenient to whatever they are supposed to be doing at the place. But with these roller shades, light control won’t be much of a problem for its handy role in minimizing sunlight intake. Even if customers will find it disturbingly hot outside, the place will give them a relaxing and cool atmosphere because of the shade the roll up shades give. 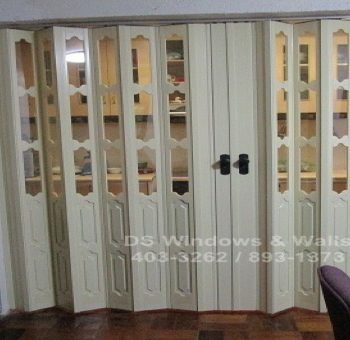 Another advantage of installing these roll up shades is the fact that these are easy to use and very customizable. It can be adjusted as according to customer or employee’s lighting preference. Some may want to roll these blinds a bit to get a glimpse of the highway outside and most would want windows covered up because it is hot. 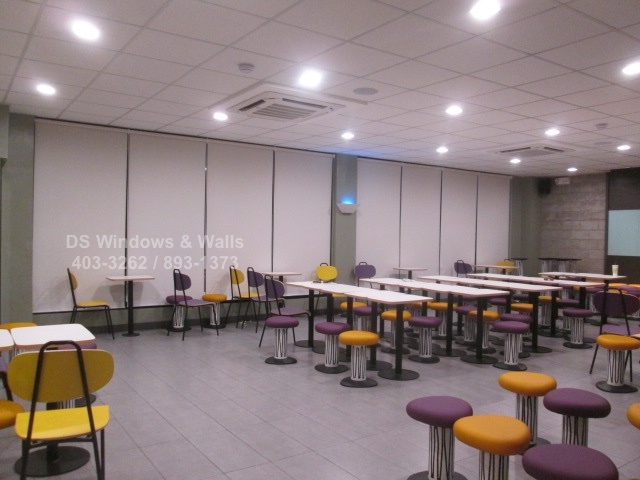 And so installing the blinds would make both scenes possible, making McDonald’s Pagbilao a very friendly and accommodating place for its customers. Aside from the mentioned uses, the roll up shades greatly contributed to the place’s neat yet stylish look. 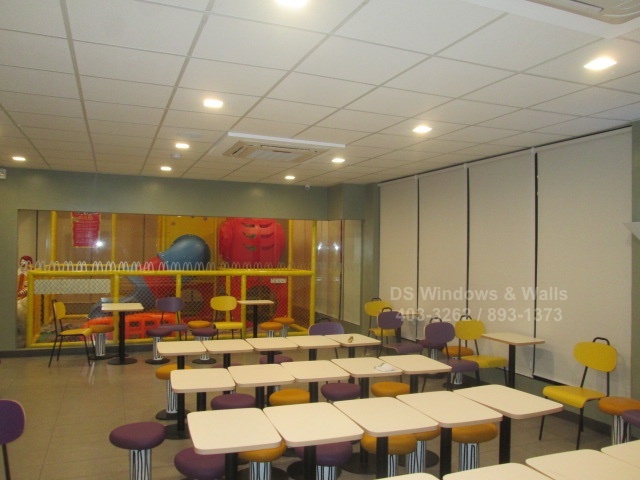 The beige color of the roll up shades blended well with the fast food chain’s look that is both aesthetic for older customers and alive with colors and patterns (due to McDonald’s interior design schemes) in the eyes of kids. To sum it up with our feature for today, it is evident that roll up shades are very convenient in light control, flexible to use and with different styles, it can match up to any design clients want for their interior’s appearance. For more information on our roll-up shades, call us at (02) 403-3262, (02) 893-1373, (02) 668-9668, 0916-311-3909. In Quezon Province, you may visit us at 2nd Floor Pacific Mall, Lucena City. We also have branches in Makati and Pasig City. You may also email us at inquiry@dswindows.com.